Dealing with any type of foot arch pain can be a disruptive and limiting experience, and foot pain can stem from many different causes. 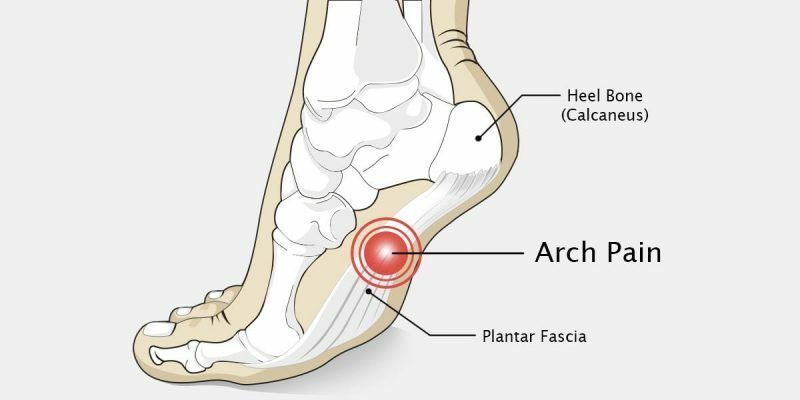 Pain in the arch of the foot is typically linked to poor shoe size or quality, wearing sky-high heels, or condensing pressure in the arch that runners may sometimes suffer from. If you typically spend a lot of your working days on your feet, you may also notice that your feet hurt and ache at the end of the day. Arch pain is one of the most common forms of foot pain. If you are dealing with tightness or sharp pain in the arch of your foot, there are specific moves that will help combat it. Many of these options are also great as a preventative measure. You’ll need a frozen juice can from your freezer for this move. Put a towel on the floor and place the frozen juice can on the towel. Place your injured or sore foot on the can, at the top of your arch. Roll your foot back and forth on the frozen juice can from the top of your arch down to your heal. Continue this movement for 1-3 minutes. You’ll need a towel for this move. While sitting on a flat surface, straighten your leg out in front of you. Secure the towel around the ball of your foot then flex your foot upwards, toes towards the ceiling. Pull the towel your midsection while keeping a straight leg. Stay in this position for at least 30 seconds and then relax. Repeat up to 2-3 times. You’ll need to face a wall for this move. Put your hands on the wall in front of you with your injured foot behind you. Put your other leg bent nearest the wall. Turn your injured foot inward, toward the other foot and lean against the wall. This stretch will be felt in your calf muscle all the way down to your foot arch. You’ll need to sit on a flat surface and cross your sore foot over the opposite leg. Wrap your hands around the bottom of your toes and gently pull them in the direction of your shin until the stretch can be felt in the arch of your foot. With the opposite hand, apply pressure to the arch of your foot as you work out any kinks. As it becomes more tolerable, press harder. Aim to do this for 3-5 minutes. You’ll need a stair or some type of elevated platform for this move. With the ball of one foot on the hard surface or stair, lower your foot toward the step below it. This will activate both your calf muscle and the sore arch of the foot. Keep this position for at least 30 seconds. Repeat 2-3 times. You’ll need a towel for this move. Start by flattening your heel directly on the ground, then proceed to pick up the towel with just your toes. Repeat this action 15 to 20 times. This will start to get easier after a while, when it does, put a small weighted object like a book on the towel to increase the difficulty level. You’ll need a chair or counter top to assist with balance for this move. Begin lightly holding the chair or countertop with both feet on the floor. Rise up on your toes and hold for at least 5 seconds. Then slowly come back down. Repeat these movements 10 to 15 times. Attempt to do at least 2 sets. This is one of the most arduous and difficult moves listed here which is why it’s the last, if you’re having significant arch pain, you’ll want to start with the simpler suggestions first.